One of the things that I’ve wanted to do for as long as I’ve known about Linux is make the switch to Linux full time. I wanted to understand how the operating system functioned, how I could use it, how I could alter it, and how I could get it installed on all of my machines. I have taken many baby steps to get to that point. For instance, from 2013-2014, I only had Lubuntu installed on my laptop and forced myself to use Linux for every task that came to mind. Of course, I also had my trusty desktop with a Windows installation. Although I definitely learned about Linux this way, I found myself often coming back to my Windows machine in order to edit with Photoshop, play some video games, or even do things without trying to make them compatible with Linux. Just recently I decided to really push for the conversion process by taking a dive into Arch Linux and putting it onto my laptop. After about 2 days of struggling to get it installed and working as I wanted, I felt super happy and super confident. If you are unfamiliar with using Arch Linux, I highly recommend it. It is a great way to learn about how Linux works and it is a great experience (and very rewarding). Anywho, so I got ArchLinux running on my laptop. 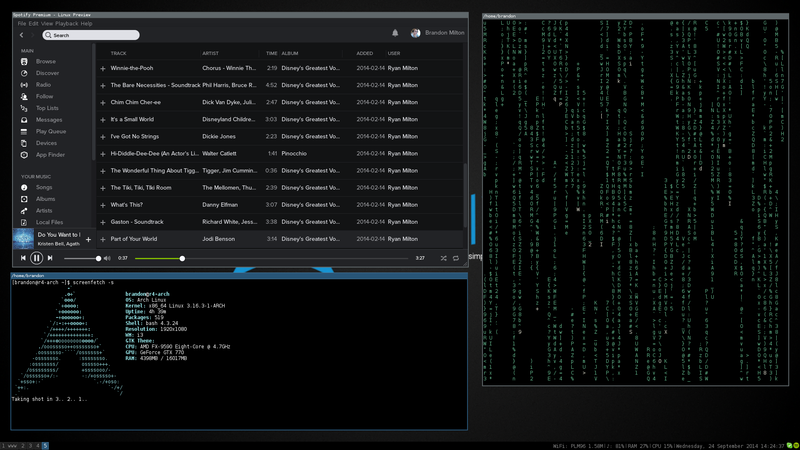 I decided to choose Slim as my display manager, X as my display server, and i3 as my window manager. I really enjoy the tiling nature of i3 and the simplicity of its dynamic windows. I have tried Awesome and bspwm, but I just cannot get away from i3 and its charm. I think my favorite part about running ArchLinux is its system resource usage. While idling, Arch on my laptop uses 150MB of its 8GB of RAM. This is definitely something that not even Windows nor Lubuntu could pull off. Maybe I am missing some precious functionality that existed in those operating systems, but I definitely don’t feel like I’m missing much. Inspired by the switch on my laptop, I decided to do the same thing on my desktop. Of course, this is a little more risky because video games have a reputation of not working all that well on Linux, but I am confident that my beast of a machine can pull off at least 30fps on the latest games running under WiNE, so I decided to give it a shot. In short, I am loving this so far. I intend on posting a more detailed guide to getting Arch perfectly setup on machines that have a similar setup to mine. For now, I will just say that I am a very happy man. 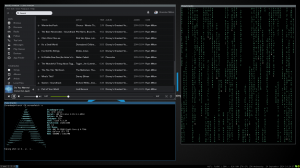 This entry was posted in Linux and tagged Arch Linux, development, experimentation, GIGABYTE, install, iommu, journal, window manager on September 24, 2014 by brandonio21.